Enteroscopy has improved more than any other form of flexible or rigid diagnostic endoscopy. Double balloon, single balloon, over-tube enhanced methods with stiffeners, spirals and design changes to push enteroscopes has made access to all areas of the small intestine much easier. These changes have improved diagnosis but have not led to changes in minimally invasive translumenal small bowel surgery perhaps because there is anxiety that small bowel distension might make surgery difficult and because few surgeons perform advanced enteroscopy. The aim of this study was to explore the potential of combining enteroscopy with laparoscopy for surgical purposes in pigs including gastrojejunal, jejunojejunal or enterorectal anastomosis, jejunopexy, and full thickness biopsy. Enteroscopy was performed in 5 non-survival 30-35 kg pigs. An enteroscope was introduced into the distal duodenum with the pig in left lateral position with and without overtubes. CO2 was used to minimise bowel distension. The pig was then turned on its back and laparoscopy was established using 5 mm optics and needle instruments. The enteroscopes were passed to the ligament of Treitz where transillumination and tip orientation was well seen by the laparoscope without overinflating the bowel distally. It was possible to pass the enteroscopes far into the jejunum. The markings on the endoscope could be read through the transparent small intestine allowing measurements of distances to be made in a new way. At sites selected for anastomosis jejunum was punctured by a needle knife/guide-wire/catheter combination and using laparoscopic forceps the ileum, colon and stomach were punctured with this guide-wire with a view to performing anastomosis at these sites. A wire passed through the enteroscope, puncturing the jejunum into the peritoneal cavity was then passed into the stomach using RF current: The tip of the guidewire was pulled back through the mouth using the catheter to reduce friction. An expanding stent was placed to form a gastrojejunostomy by passing the stent through the duodenum and back into the stomach under endoscopic vision. In other experiments the small intestine was sutured through the scope with TAS to the anterior abdominal wall. A direct puncture percutaneous mid-jejunal jejunostomy was formed using enteroscopy. 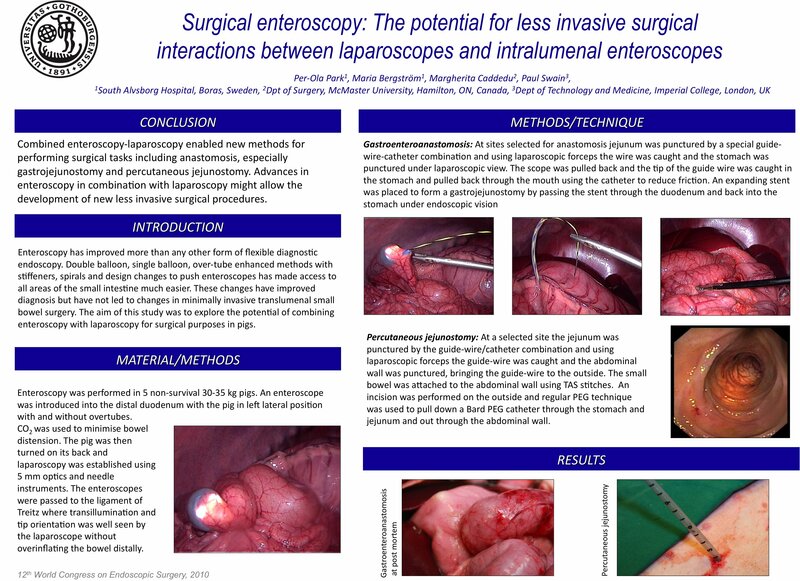 Combined enteroscopy-laparoscopy enabled new methods for performing surgical tasks including anastomosis, especially gastrojejunostomy and precutaneous jejunostomy. Advances in enteroscopy in combination with laparoscopy might allow the development of new less invasive surgical procedures.